Netherlands agency N=5 created this ad campaign for Fitness First, the world’s largest health club operator, to help increase memberships. 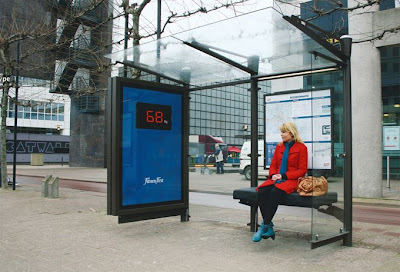 A digital scale has been added to the seat at this Rotterdam bus stop, which then shows the weight of unsuspecting travelers in the advertising display case. I’m not sure if the campaign will have the intended effect of increased memberships, as I’m sure the company runs the risk of offending as many people as it impresses. Nevertheless, the idea is original, inspired and a memorable piece of advertising.